Purchase the CAT-15020CR-22060 NOW and receive a Limited Time Offer! The CALIFORNIA AIR TOOLS 15020CR-22060 Ultra Quiet & Oil-Free Continuous 2.0 Hp Air Compressor is designed to be one of the quietest air compressors in the industry having only 67 decibels of sound. Up to 8 hours of continous running at 90 PSI and 12 hours at 40 PSI or less. The CAT-15020CR-22060 Air Compressor has a Oil-Free Piston pump designed to have a life cycle before wear of 3000 hours of usage. 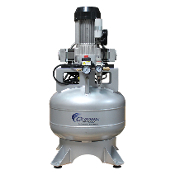 The large 15 gallon steel stationary air tank is just the right size for a shop, warehouse or factory.